Today we introduce the first of five interviews with course builders of the U.S. professional cyclocross circuit, all conducted by Andrew Juiliano. While he was the editor-in-chief at ROAD Magazine, Andrew interviewed all five for a retrospective on the 2016-17 cyclocross season. However, the magazine shuttered in February 2017, and the interviews were caught in publishing purgatory, posted the same day that H3 Publications went out of business. Thus, they aimlessly float through the Internet ether, still out there somewhere. Andrew provided In The Crosshairs the transcripts from his interviews hoping to bring these in-depth conversations to the dedicated ‘cross fans who would appreciate it most. And what has the shaggy-haired Californian been up to since his cush editorial gig evaporated? He’s gone off the deep end and committed to full-time cyclocross racing. He’s moving to Belgium in October and will race five months in the Holy Land. Why? Because he claims 3 years working in cycling publishing has rendered him unfit for any other occupation, and because 29 is the perfect age to start a professional cyclocross career. Stay tuned for an episode of Crosshairs Radio with Andrew regarding his newly-announced team Grit World Racing and its European saga. In the meantime, peek inside the minds of some of North America’s greatest course creators starting with Jeff Lucido, the Texan behind last year’s brutal CrossVegas World Cup parcours. I got my start as a shop kid in high school working for a local bike shop and did that part-time while I was in high school. I stepped away from it after college and was working at a real job in the real world and everything. I came back a while ago stepping in as a consultant for the computer networking at Richardson Bike Mart. We have three stores. It’s a 34,000 square foot bike store. It’s huge. Just in this one store, which is the main store, we run 34 computers. I used to race bikes through high school, during college and after college. I was travelling too much with my first job out of college … I’m a pretty competitive person, so I gave up cycling instead of being frustrated at the lack of training and ability to compete at a high level. With working and traveling and having kids I got really fat. One day I went to the doctor, and he told me I had high cholesterol. Both my grandfathers died from heart attacks. I also had some markers in a blood test that suggested I was heading towards diabetes, so I said, “Yeah I don’t want to do that!” So I just started riding my bike again! I stumbled into a local weeknight ’cross race that was a mile and a half from my house and thought to myself, “Okay I’m going to do that next year.” That was 2011. I did a few of them and thought, “Gosh this could be better.” I had promoted some races when I was in college and a couple of large crit races in Austin back in the day. I was already in the mentality of not complaining and just offering a solution. I threw my hat in it and just said, “Hey let’s see what it takes to build one of these ’cross courses!” I quickly became humbled and felt like I was a failure at that event. I was determined to do a better job the next year. What was that first race? It was a combined [two-day] weekend event that was actually in Garland in 2012. I learned that you don’t set up two courses with one set of stakes in two different venues on back-to-back days! [laughs] I was in Garland in that park at 4 in the morning setting stakes and taping by myself on a cold night with one light tower. How many courses do you think you’ve built since then? Gosh I don’t know! I did weeknight races too. We averaged eight races a season and four seasons, so that’s 32 right there. In total, 60-plus probably. What’s your process for designing and building a course? I want to make my courses challenging, but I want to avoid extra bumpy segments. Sometimes I spray paint little dots on the ground and then I can ride it with my bike and say, “Okay that feels good.” Then, I can hit it with some speed and see if it’s challenging. I’ll make riders carry a lot of speed into something, make them scrub it and then turn a little more and have to think about carrying that power out of the corner. I usually get that from riding after walking the space. Oddly enough, I don’t usually get the time to ride my courses. Someone asked me, “How do you think you could improve your courses?” I said, “I could race them!” If I could race them I’d probably get a better feel for it. By no means I am a pro, but it would be nice to see what someone with my minimalist handling skills could do. I’ve got to give credit to one of the guys I learned a lot from. [He’s] a former pro from our area, Bryan Fawley. He has as much passion for the sport as I do. He wasn’t so much teaching me, but just telling me how to create race courses. I took that kind of knowledge and just put my own spin on it. I like to cut the course into 45-second segments. It’s 45 seconds of pain maybe followed by some [recovery or technical section]. I was paying more attention to some of the World Cups from Europe. They aren’t doing that choppy stuff that we have done in the past, so [I] pull that out. To me, I would be kind of insulted if there was a pack of five or six riders riding together. But that’s not a bad thing, because we want this to be as much of a spectator sport as it is a challenge to the actual participants. 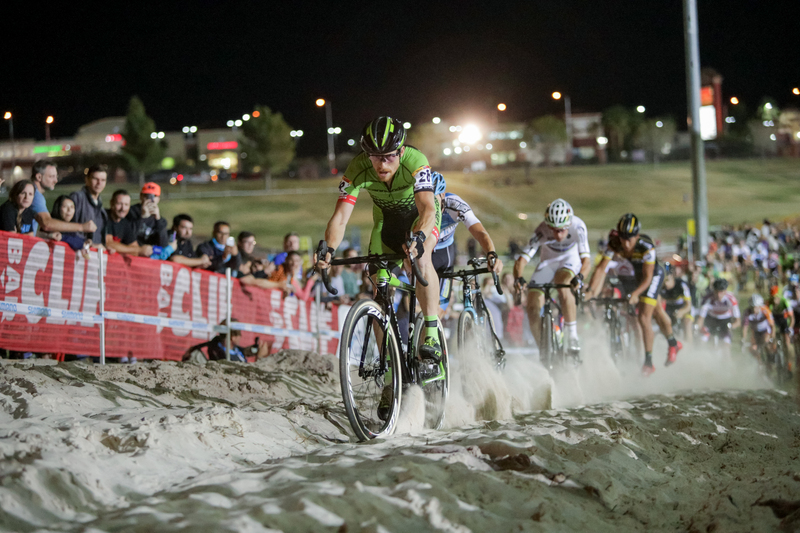 Stephen Hyde (Cannondale-Cyclocrossworld.com) leads into the uphill sand pit at the 2016 CrossVegas UCI World Cup. 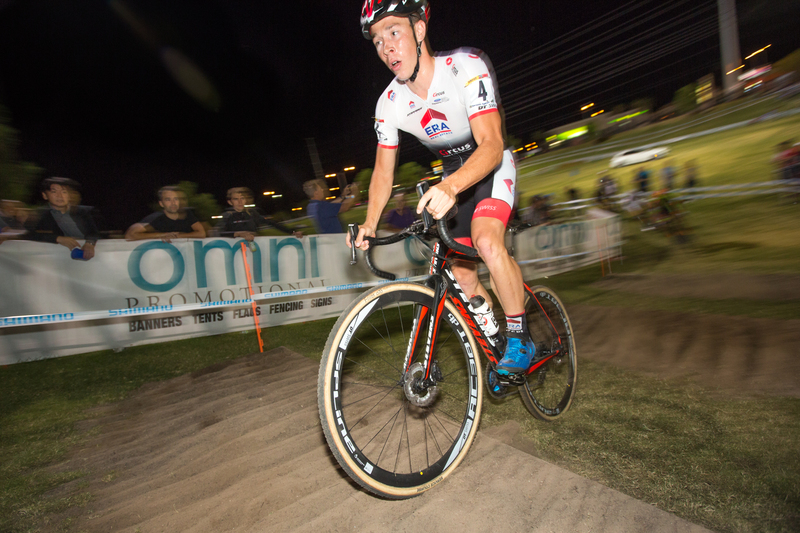 You took over the course design at CrossVegas and made some changes that racers said made it more challenging. Would you say that uphill sand pit was the defining feature of that course? I don’t think it was the defining feature, but it was one of them. I think the other part was the stairs at the bottom of the long hill climb. Between me and my crew of Tanner, Ian and Sam, we were calling that Taint Punch Hill [laughs], and looking back at the video guys were crawling at the top of it. Other than the first five or six guys on course, everyone was going kind of slow. There was some carnage in that race! People blowing up off the back in the men’s and women’s races. It was thrilling to watch as a spectator from the area with the sandpit. Watching the last two years, most people were standing on the hillside looking down into the bowl, especially because of where one of the TVs was situated. I thought that with [the more condensed course layout] you could stand up at the top or be down kind of in the middle away from the Raleigh ramp and you could see everything. Because of the way it’s built, it’s a two-step bowl from the lowest possible part. It was one of those courses where I didn’t have my bike with me, so I didn’t get to ride it, but watching how the racers were carving some of those lines, there are probably about four corners I would change for , if I have the opportunity again. I think the course needed a little more technicality to it. Technical in terms of making the corners tighter or just making them harder to ride? Harder to ride. They were carrying quite a bit of speed into some of the stuff, so I want to challenge them a little bit more. What’s your favorite course domestically and internationally? Internationally, Hoogerheide seems pretty interesting to me at least in the years I’ve watched it, and then probably Namur is one of the other ones. The off-camber stuff just looks rad. Zolder looks cool too. I’d love to see that. My wife and I cashed in our miles and some of our points so we are going to get to see them ride this year and we’ll be able to see Hoogerheide this year and [2017 World Championships in] Luxembourg as well. I’m pretty excited. I told both Brook Watts [CrossVegas promoter] and Richard Fries [KMC Cross Fest promoter] I’m not the type of fanboy that will say, “Hey get me in behind the scenes,” but I do actually want to meet some of these course people and ask them some questions and stuff. I don’t need to be the fanboy for the racer part of it or with the racers or teams or anything, but I do want to meet the actual course people. The guys who are like me who are pounding stakes into the ground, you know? I want to talk to them. Do you have a favorite domestic course? Of the ones that I’ve seen, and as far as a venue goes, I’d say Patrick Goguen’s setup at Providence two years ago was probably one of my favorites. That’s a pretty bright guy right there. What are some of the unique regional considerations for Las Vegas when you’re building courses? As far as CrossVegas, I wanted the spectators to feel like they were involved in the race, and I wanted it as difficult and challenging as possible for the racers. I didn’t want to make it feel like they were playing team tactics to try and split the field. I can only guess that if the race was easier then they would have a group of 15 dudes all riding together, and I didn’t want that to determine the outcome. Nobody watches ’cross to watch team tactics! Yeah, exactly. You want the guy with the greatest amount of skill to win, in my opinion. So that was also a goal when you designed CrossVegas? I think personally we achieved one of the goals for sure, and that was spectator involvement, by bringing it all down into the bowl with that one last corner and that set of stairs before the finish. My outline for that actually had a different approach angle, which I don’t think they would have ridden since they were so close at the finish. When we laid it out and set it out, Brook was like, “I think that’s too hard,” and I was like, “There’s no such thing.” [laughs] These are world-class racers. I really wanted to see like a 50/50 shot where 50 percent of the riders dismounted and the rest rode it, which is exactly what happened. Laurens Sweeck (ERA Circus) rides the stairs before the finish line at the 2016 CrossVegas UCI World Cup. Features to race to before the finish line add excitement. If you have a couple of different zones and they are going to race for those, then all of a sudden you have so much more action beyond the finish. That was the case for sure especially in the women’s race. They were dicing it out and they came through the pit and then they had to go over that flyover. Sophie [de Boer] had kind of dangled off the back a little bit. Then she came back on the last lap, and she hit it really hard and they went three-across over the top of that flyover. They knew the first one to the stairs was going to win the race. At least in the women’s race, I think that was the deciding factor. I wanted those sets of stairs, and the stairs on the backside at the bottom of the drainage opening, I wanted those to be the deciding factors of how things would happen. What do you think about pro-only sections on courses? I want to inflict some pain in a few sections and take you to 110 percent or whatever your max is. I want to destroy you but I don’t want you destroying equipment. I feel like we can still make the courses difficult enough that the pros don’t feel like they are racing a dumbed-down course. All photos © 2016 Bruce Buckley. I have a mixed view. Anyone can negotiate any section, it’s really the speed and smoothness that changes. Therefore nothing is “too difficult”. However, on a course with too many challenging features for amateurs, lap times become too long and therefore slower riders may complete too few laps. Additionally, the flow of the course can degrade if there is not the skill to ride lines as intended. Both of these can reduce the “fun” factor of a course. Additionally, if the Pro’s are left to ride a section that’s well within their capabilities, but after hundreds of less-skilled amateurs have 1) created alternative lines 2) marred the surface with footprints etc. than it can change the nature of the Elite race. Therefore, Pro-only sections are warranted as long as they are truly an elite-only level of difficulty or are excluded to maintain appropriate lap-times for amateurs.